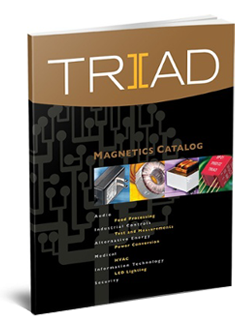 Triad Magnetics' mission for our Custom Design Products is to thoroughly understand a client's magnetics needs and then ensure that the fulfillment process from design to delivery exceeds the customer's expectations. To accomplish this mission we hire experienced design engineers with a wide range of design experience which allows them to have some insight into most applications. Unfortunately in most college Electrical Engineering Curriculum, transformer theory is typically regulated to one chapter of a basic electronics course. Given tens of thousands of different magnetic materials: cores, laminations, bobbins, insulation; and infinite possibilities of combining the above, along with a myriad of different applications, designing transformers requires many years of experience before an engineer is truly fully competent. Triad's Senior Design Engineers have over 25 years of experience, and our newer engineers undergo a rigorous training program over 5 to 7 years before they are considered a Design Engineer. Triad's training program incorporates design theory, physics, mechanical engineering, customer applications, safety agency requirements, sample building, production engineering and more. Our aim is to be a design partner contributing to the success of our customer's end product. In addition to working with our customers to develop their basic specifications, we also provide input on Safety Agency requirements, and like to discuss trade-offs between performance, size, and cost. The goal is to provide an optimized design for the customer's application. Our engineers are readily available to discuss customer requirements. We have the capability to produce proof on concept prototypes in California within a few days of the finalizing the design. Production samples are typically delivered from our factory in China within 2-3 weeks.